Sunday morning started at Le Marche. 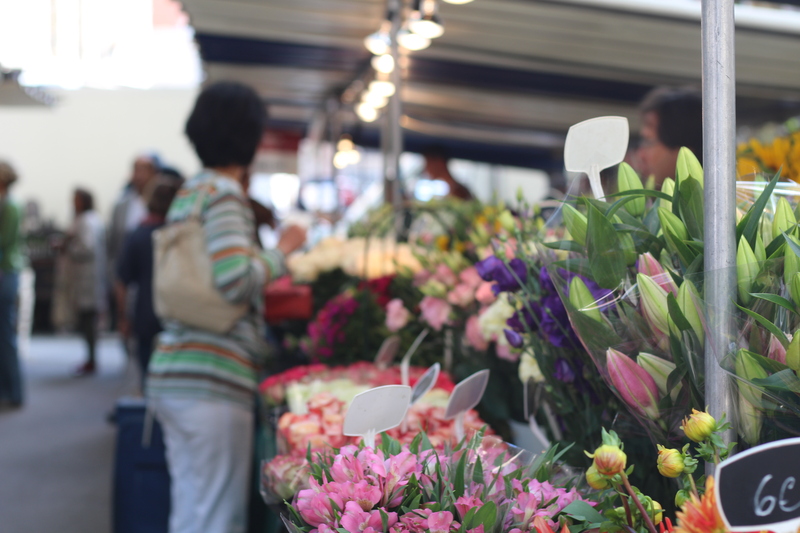 Three days a weeks there are outdoor markets in every arrondissement. 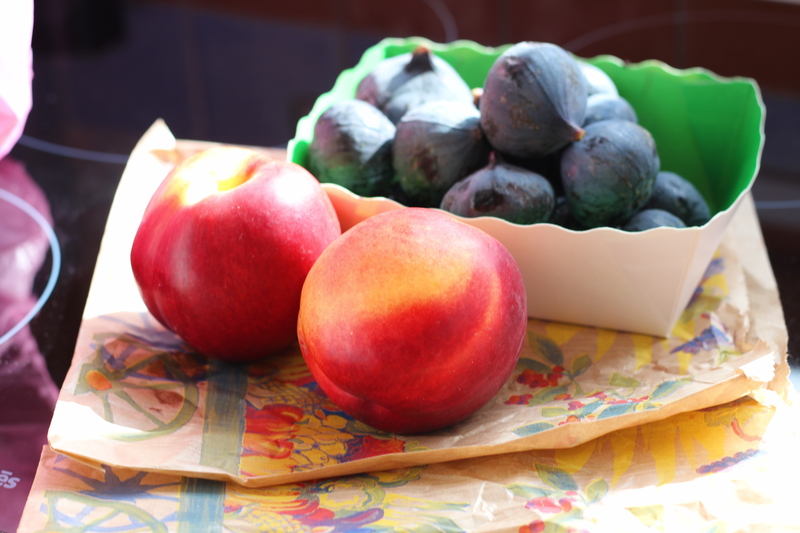 I went to the market at Place Monge ~ a 5 minute walk from my flat with my wicker basket in tow. At first, I just strolled slowly taking it all in. I waited for inspiration (which did not take long) before I made any purchases. The smell of rotisserie chickens was intoxicating from a vendor I passed. The rotating birds looked even better, as their drippings and juices were compiling at the bottom of a rotisserie machine, onto a platter of potatoes and shallots. I quickly walked to one of the butchery vendors where the line was already 10 people long. I gladly ordered my Poulet Roti and smiled as the vendor waved me away with Bon appetite. Also purchased, were an assortment of vegetables, figs, nectarines and the most beautiful flowers. 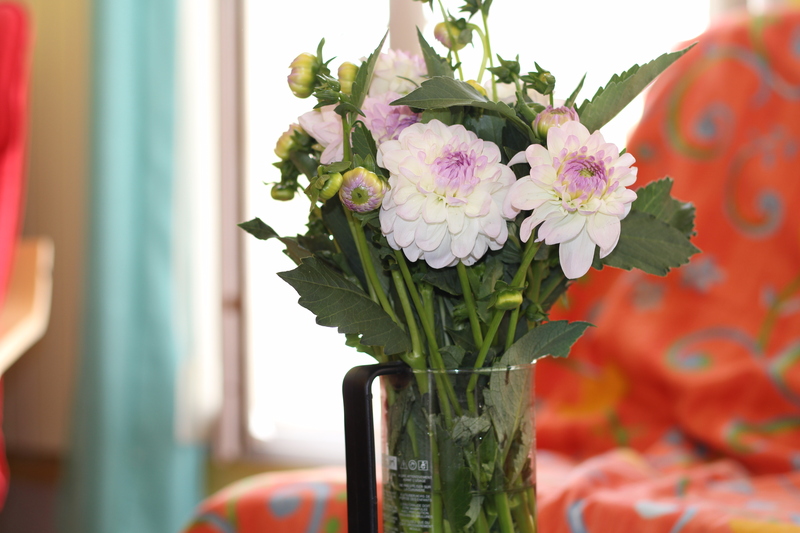 Yes~ I am temporarily using a french press coffee pot as a vase 🙂 must get a flower vase. On my list! There is something about France that makes me want to roast a whole chicken. Maybe it’s because I want to imagine what Julia Child was doing everyday and what she was cooking in Paris. I imagine she was chopping onions and roasting chickens frequently. I did not roast a whole chicken. 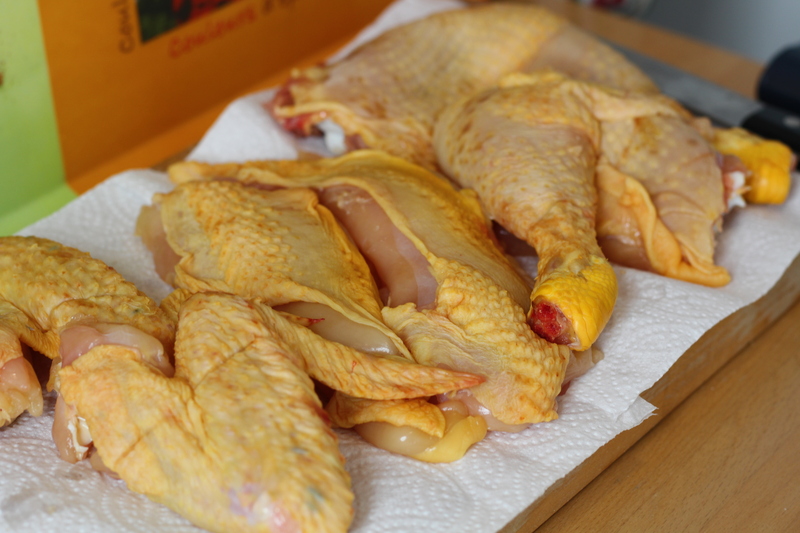 In fact, upon returning from the market I removed the carcass and broke it down into 8 pieces. (2 breasts, 2 thighs, 2 drumsticks, 2 wings). Now… I am very comfortable breaking down a chicken because to pass butchery class in culinary school, we had to be able to do this in 2 minutes. BUT you can also ask your butcher to do it for you. Or just purchase individual pieces of breast/thighs/drumsticks. 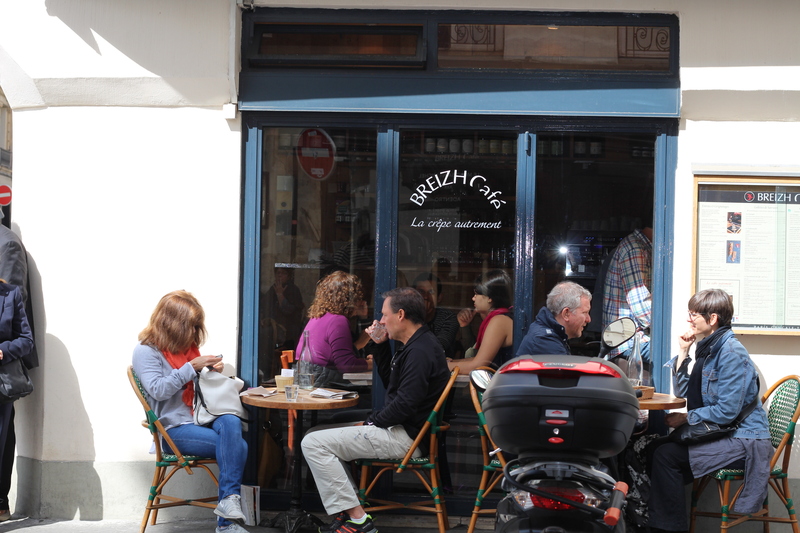 I had read Clotilde’s Edible Adventures awhile back (she is a french food critic who resides in Paris) and so I embarked to the fabulous Breizh Cafe in the Marais district. 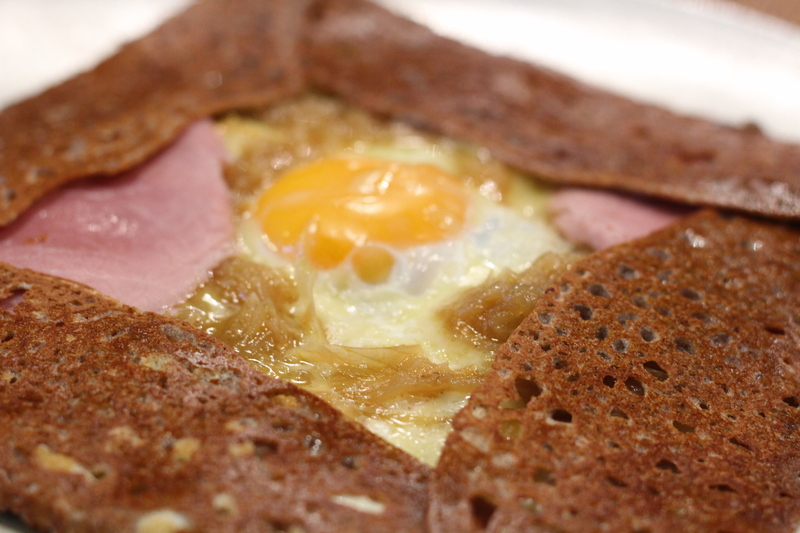 Bertrand Larcher opened this creperie first in Brittany, France. He then went to Tokyo with his Japanese wife and opened locations there, then he returned to France to open this Parisian location. I left my flat, map in hand, to find this creperie about 2 miles away. What I love about Paris is this. While I am walking down the streets according to my map, I will look up and BAM! There is another masterpiece in front of me. 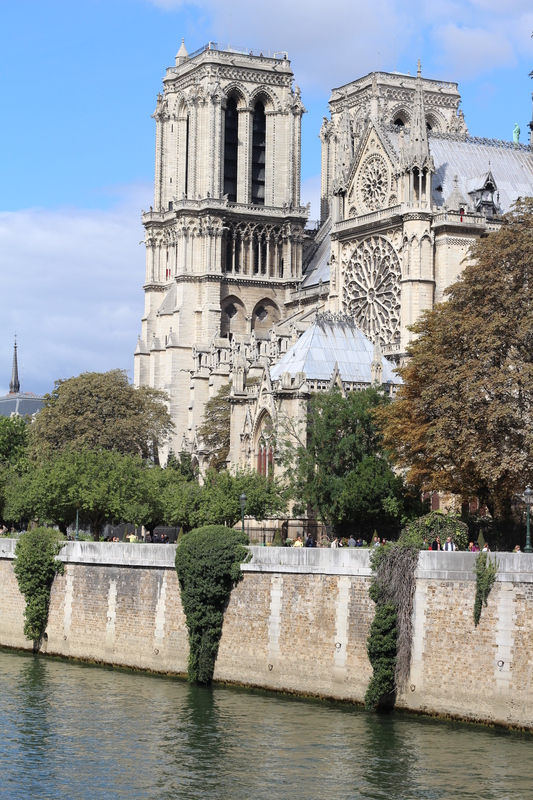 In this case it was the Notre Dame Cathedral. 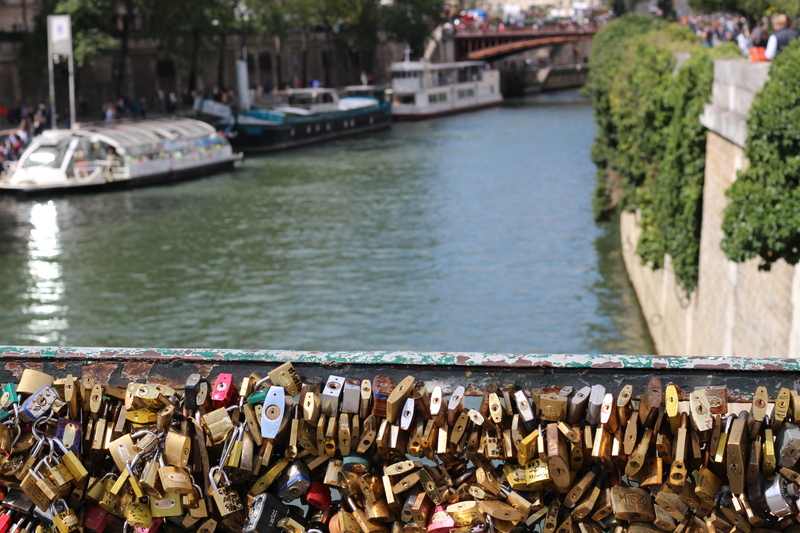 Next, I walked over the Lover’s Lock Bridge… thousands and thousands of couples have placed a lock on this bridge as a symbol to their love. Isn’t Paris so romantic?! When I approached the server he told me the wait was an hour. I looked at the plates coming out of the kitchen…hmmmm. Yep. I decided that I would wait the hour to experience this! So, I spent some time wandering the streets of the Marias district and popping into small boutiques. I returned starving at 2:30 pm. I was seated about 10 minutes later at a communal table. I sat next to a girl from New York named Meg. We immediately connected obviously, as we were both from America and spoke english. Now, she is doing something incredible that I greatly admire. She just completed grad school and is venturing off for 3 months traveling throughout Europe. By herself. She said she is starting in Paris, then heading to Amsterdam…then London, Italy, Prague, the French Rivieria, Spain…and more. All she booked was a one way ticket to Paris. And her hotel in Paris. She does not have a plan yet for the other countries other than she is going! I thought I was out of my comfort zone. This girl is something else. We had a lovely chat over the most fabulous crepes I have ever had. I ordered the “Onion Complete” which is a savory galette made of buckwheat flour, ham, caramelized cider onions, gruyere cheese and a sunny side up egg. Magnifique! They also serve “bowls” of apple cider. Absolutely heavenly. Meg ordered a sweet crepe. It looked equally as enticing. They serve an assortment of both sweet and savory crepes and if you are in Paris ~ I highly recommend this place. 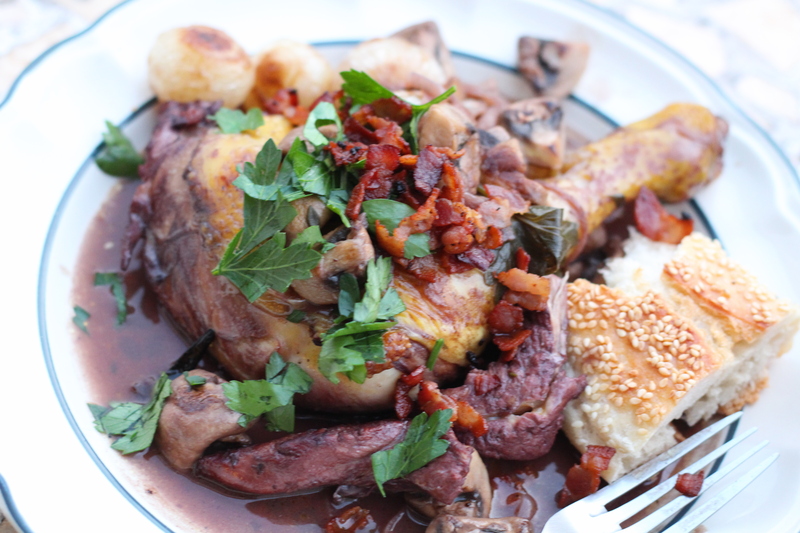 Once home…I relaxed for a bit and then got to work on my Coq Au Vin. 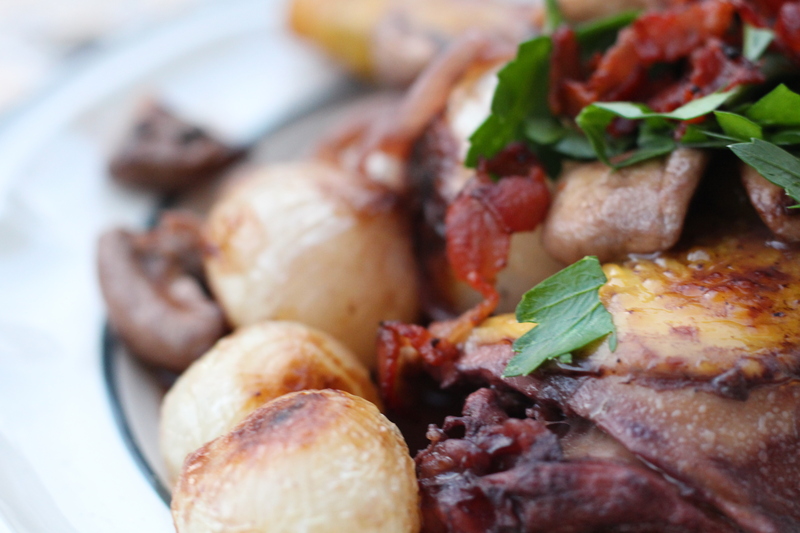 Actually, this is a very simple version of Coq au Vin. The cooking takes about an hour. Doing prep ahead definitely makes it easier. 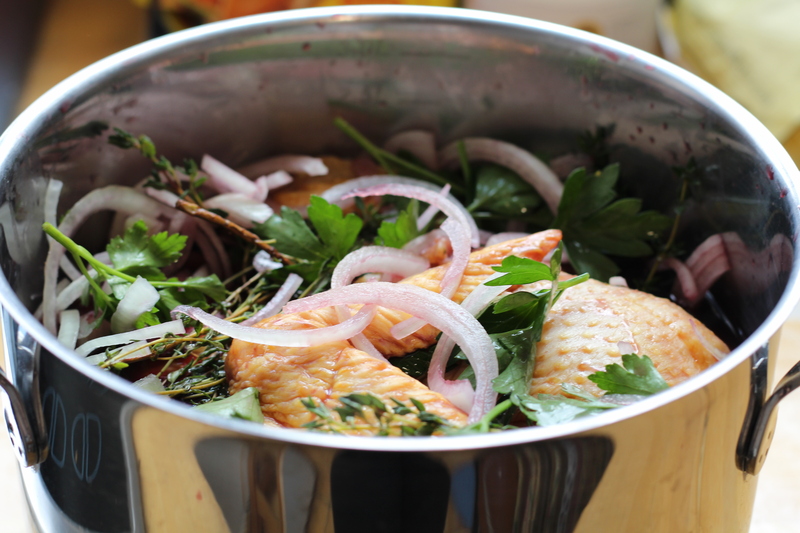 I love dishes like this for a leisurely Sunday… you can marinate the chicken, then run out for errands. You can peel the cipollini onions, then do laundry. You get the picture. Yummy! I felt this dish was appropriate on the eve of my Sommelier School starting. Cooking with wine- I used an inexpensive Bordeaux here. I suggest reading the entire recipe before starting. Get yourself organized and it shouldn’t take as long. I promise this is a dish you want to make. *Please boil and peel cipollini onions. To find out how they have great 30 second videos on Youtube. 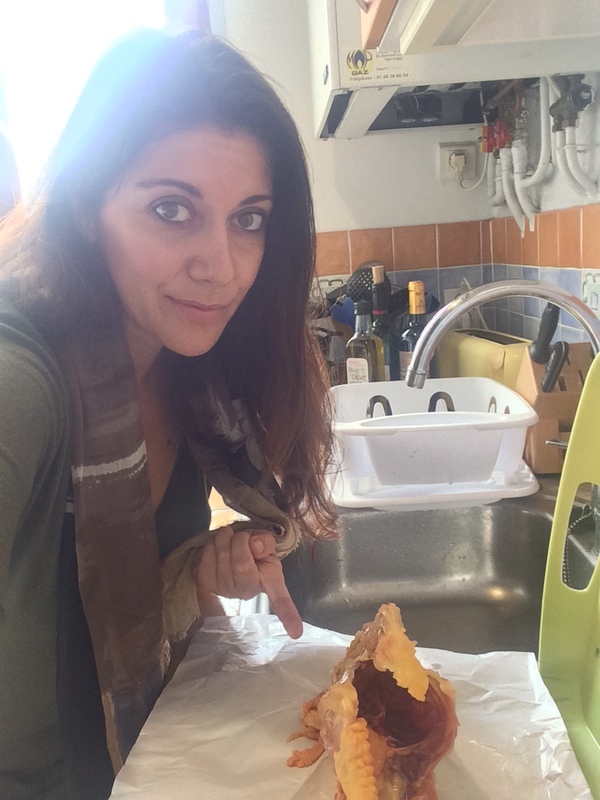 It should take you a total of 5 minutes to get cipollinis prepared for cooking. 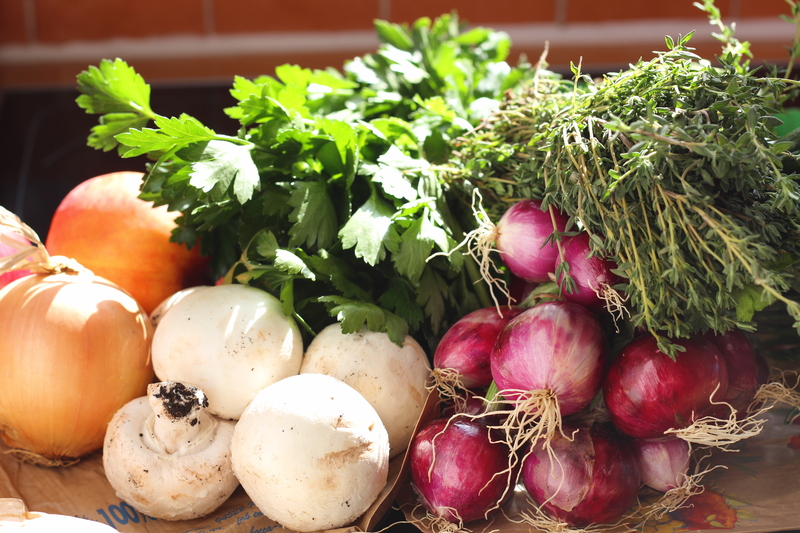 Combine wine, chicken, yellow onion, and bouquet garni in a bowl; cover with plastic wrap, and let marinate in the refrigerator at least 4 hours or overnight. Drain chicken, onions, and bouquet garni, reserving wine, and set aside. Dry chicken thoroughly with paper towels. Heat oil in a 6-qt. Dutch oven over medium-high heat. Add pearl onions, and cook, stirring often, until lightly browned and tender, about 10-15 minutes. Using a slotted spoon, transfer to a bowl and set aside. Add mushrooms to pot, and cook, stirring, until they release all their moisture and brown lightly, about 8 minutes. Season mushrooms with salt and pepper. Transfer to bowl with pearl onions; set aside. Add bacon to pot, and cook, stirring, until it renders its fat and is crisp, about 10 minutes. Using a slotted spoon, transfer to paper towels to drain; set aside. Add 1 tbsp. butter to pot, and then season chicken with salt and pepper, and add to pot; cook, turning once, until browned on both sides, about 10 minutes. Transfer to a plate, and set aside. Add remaining two tbsp of butter to the pot. Add drained yellow onions to pot, and cook, stirring, until soft, about 10 minutes. Salt the onions. Add flour, and cook, stirring, until smooth, about 2 minutes. Stir in reserved wine and stock, and then return chicken to pot along with bouquet garni; bring to a boil. Reduce heat to medium-low, and cook, covered and stirring occasionally, until chicken is tender, about 15 minutes. Remove from heat, and stir in pearl onions and mushrooms. Divide among serving bowls, and garnish with rendered bacon and parsley. Love that you are meeting ‘random’ people! Yum Krista! Can’t wait to make your recipe! Beautiful photos and I loved your post ! Si belle…Beautiful!! What a treat to follow you around Krista. And I will try this recipe tomorrow as I am salivating looking at the pictures and recipe. Evelyn! So wonderful you already made the recipe. Love to you!